The ta5000F (Flame Ionization Detector) and the ta5000R (Reduction Gas Detector) gas analyzers are extremely sensitive from parts per million (ppm) down to low parts per billion (ppb) levels. This sensitivity combined with the separating power of gas chromatography makes for a truly unique system. 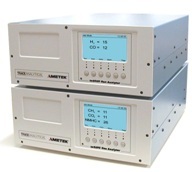 Modern user interface features make the ta5000 the analyzer of choice for selective measurements of impurities in air, for pure gas quality control and research and for numerous other gas monitoring applications. The ta5000 platform includes a dedicated sample processing system, a single high sensitivity detector and on-board data analysis electronics. See the Documentation tab for details regarding specifications on this product. Refer to the Product Data Sheets in the Documentation tab to see the applicable certifications for this product.